In addition to the cost, burning CDs is time consuming and error prone. Often, patients have to drive to the facility where they had the scan to get their CD, and who hasn't opened a CD only to find that they can't read the images or that it is the wrong study? Embedding a viewer can help, but viewers can be difficult to use. Also, CD burners that handle larger volumes are more expensive and prone to hiccups. Frederick Regional Health System, which serves Frederick and Central Maryland, was burning as many as 1,500 CDs a month for patients. Because of the cost and inconvenience, the hospital's decision-makers decided they needed to make a change. The solution? Moving imaging studies to the cloud. A colleague at Frederick Memorial Hospital (FMH) suggested the idea to Brian Petrie, BS, RT (CT)(R) A+, MCP, CIIP, the hospital's PACS administrator. Once he thought about it, Petrie became convinced that not only moving images to the cloud but also giving patients access to them was a good idea. If patients had access, the health system wouldn't have to burn so many CDs, Petrie reasoned. To study the pros and cons of the idea, the hospital formed a committee that included the director of radiology, its PACS administrators, and other members of the medical staff. After several months of meetings, the committee decided to move forward. When the health system was debating the use of Access My Images, some were concerned that patients would see their images, not understand the results, and panic until they heard from their doctor. But it hasn't been a problem, according to Mark Glass-Royal, MD, a diagnostic radiology specialist at FMH. 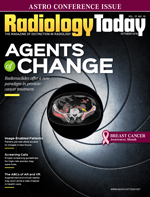 "Radiologists, being in the radiology business, are used to looking at these images and knowing what's there. A study could show a patient to have widespread cancer and, if the patient doesn't have anyone filtering that information for them, they could be very worried. I thought this could be a potential downside," Glass-Royal says. "But that doesn't seem to be what's happening." He thinks perhaps most patients don't understand what they're looking at when they see their images without the reports and are willing to wait for their doctor to interpret it for them. In the first three months since Access My Images went live on the Frederick Regional site, patients have logged in more than 900 times. It's difficult to define how many patients are using it, however, because the same patients may have logged in multiple times, Petrie says. One requirement Frederick Regional had when Ambra built Access My Images was that it be secure and compliant with the HIPAA Privacy Rule. The director of security for FMH had concerns about security and privacy when Petrie proposed the idea, he says. "But when she learned it was an [SSL-encrypted] site, she was satisfied with that." Patients go through a list of security questions to sign up and receive a personal identification number that's good for 10 minutes via their e-mail or mobile phone, Petrie says. Once they enter that number, they can sign on and watch a video to learn how to view and download their images. Patients' diagnostic quality imaging studies appear in their portal within two hours of their procedure, Petrie says. The radiologist's report on the study appears in the patient portal within 36 hours. Patients are alerted via e-mail when their studies arrive in their portal, and they can retrieve studies from the last five years. Patients are able to send their images to their doctors when they seek a second opinion. The doctors can then import them to their PACS systems. It's also very helpful, Petrie says, for patients who need their imaging studies when they're traveling or away from home. Petrie says most of the patients who seem eager to view their studies are younger people. "[People in their 70s, 80s, and 90s] seem to have more issues. Some older folk register their account with their home phone, not realizing that it needs to be a mobile number to receive text messages," Petrie says. Other times, he says, he is "amazed at how technology savvy some older folks are." Patients have to be older than 18 to use Access My Images, and only the patients can access their own images. Technically, family members shouldn't use a shared account, Petrie says. But, he acknowledges, family members can get around the rules by sharing passwords. To date, feedback on Access My Images has been positive, Petrie says, and he has only had one patient request to close her account because she didn't want her images on the cloud; she was concerned about her privacy. His assurances that "this is a highly secure website," didn't allay her fears. "Everyone today is concerned about getting hacked," Petrie says. Some of the images are huge files. Some mammography scans, for example, can be up to 4 GB, Petrie says. Some patients who don't have a lot of bandwidth may be frustrated when trying to access their images because it can take a while for them to load. Patients probably need to have cable connections to be able to see their images, but Petrie notes that it's rare that they don't. "So far bandwidth hasn't been an issue," he says. Glass-Royal believes that software such as Access My Images is the way of the future. "Lots of places are offering patient portals for office visits, bloodwork, and other test results," he says. Although Frederick Regional is one of the first to offer patients access to images, Glass-Royal believes radiologists and patients will likely get used to being able to see their images, and when they do, they may come to demand it. "I think it's a good thing," Glass-Royal says. Panner says health care seems behind the rest of the world when it comes to implementing some technologies. "Health care seems to be the last one using a fax machine and burning CDs," he says. "Now they have this ability for patients to share their images easily with their private practice group and doctors outside the hospital where they go for treatment." Health care today is also about the consumer and having a good experience, Panner says. "Everybody is focused on the increasing importance of the consumer, how they make choices, and how they interact with their health care providers," he says. Anything that hospitals and health systems can do that gives them an edge when it comes to customer satisfaction is important, he says. Panner believes that Frederick Regional's effort "should help drive customer loyalty." At least one FMH patient is happy he that he was able to see his images on his portal. In May, Larry Harper, 69, of Frederick, fell asleep in his recliner watching Saturday Night Live. He woke up at 2 AM and jumped up. In doing so, he experienced vertigo and fell on his right side, hitting the fireplace. From the sound he heard, he knew he had done some serious damage to his shoulder. "It went, 'pow!'" he says, "and I knew it was gone." He lay on the ground for a while. "As I laid on the floor after the fall, I realized, 'Oh, this is how it is when you take your last breath,'" he recalls now with a chuckle. Eventually, Harper was able to get up and his wife drove him to the emergency department at FMH where he had his shoulder X-rayed. It showed that he had indeed dislocated it. "They were able to pop it back in place, which was quite painful," recalls Harper, who works in mental health. His arm was put in a sling, and he was sent home. When the X-ray technologist took the images, she told him that they would be available for him to see in a few hours. On Sunday, Harper received an e-mail message that the images of his shoulder were available for him to see if he signed on to Access My Images; he did so. Although Harper had seen his X-rays at the hospital, he pulled them up in the portal. "And it was fun," he says. "It gives you more of a sense of control. This isn't just authorities telling you what's wrong; you can look at it and see for yourself." If anything, staring at the X-rays of his dislocated shoulder motivated him to get the follow-up care he needed, he adds. Harper says he also liked that he was easily able to share the images with the nurse practitioner at the orthopedics office where he went for follow-up. "With Access My Images, you never have to worry about your images getting lost," he says, again with a chuckle. Because he could do so, Harper also called up his images and shared them with his colleagues when he went back to work on Monday. He could use them to play the sympathy card. "It was a good dose of reality and fun at the same time," he says. — Beth W. Orenstein, a freelance medical writer from Northampton, Pennsylvania, is a regular contributor to Radiology Today.